A 61-year-old Miami Beach woman has filed a lawsuit against the Miami Beach Botanical Garden after she landed in the hospital from ingesting a cocktail laced with liquid nitrogen at a fundraising event in January. The woman said after she took a drink from the cocktail the pain was instantaneous. The toxic cocktail burned her insides, forming holes in her esophagus and stomach. The liquid changed to gas inside her body, which created the need to expand. Doctors rushed the woman into surgery. The incident occurred in January during the Taste of the Garden event at the Miami Beach Botanical Garden. A bartender from Haven lounge on Lincoln Road served the woman the cocktail, but did not tell her to wait until the liquid had evaporated to drink it. To create a dramatic effect, some bartenders chill cocktail glasses with the liquid nitrogen so that puffs of white smoke appear when liquid is added. Very little liquid nitrogen is needed for this spectacle and it should evaporate before it is served. It should never be ingested in its liquid form. The woman is now suing Miami Beach Botanical Garden, Haven Hospitality Concepts and Kryogenifex, the company who supplied the liquid nitrogen for the event. She claims that she is unsure of the long-term side effects, but she now has a raspy voice and has to follow a limited diet. This is the second time Haven has been involved in an incident with liquid nitrogen in the past two years. A 39-year-old Aventura woman had two drinks in 2012 at Haven Lounge. After consuming her second cocktail, which included the liquid nitrogen effect, she fell to the floor and was unable to breathe. She did not suffer any permanent damage, but she did file a claim against Haven and eventually settled for a total of $15,000. According to The Telegraph, in 2012, a British teenager consumed two shots infused with liquid nitrogen and had to have a portion of her stomach removed. That same year, a guest at the Czar Ice Bar in Atlanta was taken to the hospital after drinking a drink laced with liquid nitrogen. Liquid nitrogen has a temperature of -320 degrees Fahrenheit and is not authorized for use in food by FDA regulations. If it is not used properly it can cause permanent frostbite or cryogenic burns. It is not supposed to be mixed into alcoholic drinks for immediate consumption. However, more and more bars and restaurants are using liquid nitrogen to stage dramatic effect. 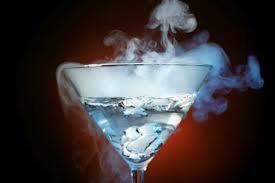 When the glasses are chilled, adding liquid nitrogen can cause a chemical reaction that emits a steamy vapor. As this case shows, a person should never drink nitrogen in its liquid form, as it will turn to gas inside the person’s body. If liquid nitrogen was served in your cocktail and you suffered harm, then you have the right to seek financial compensation for damages from the bar that served a dangerous liquid in your drink. To learn more about your legal rights and options, please call a Florida Personal Injury Lawyer at Whittel & Melton today at 866-608-5529 for a free consultation. You can always contact us online 24/7.